I spot the Otorii from across the expanse of the (Seto) Inland Sea, emerging from the waters like a giant Pi symbol against the dense green mantle of the hills beyond. More bleached terracotta than the vermilion of the postcards, this 52 feet high floating ‘grand gate‘ claims equal billing with Mount Fuji as the iconic symbol of Japan. I expect our ferry to pass right under it, quite like pilgrims from a bygone era, when this was the main access to the holy shrine of Itsukushima. But we swerve left and disembark at a pier farther North, to be greeted by a band of resident sacred deer. Delight turns to dismay (and amusement) as we watch the brazen, aggressive creatures appropriate a couple of guidebooks from the unsuspecting hands of fellow passengers! 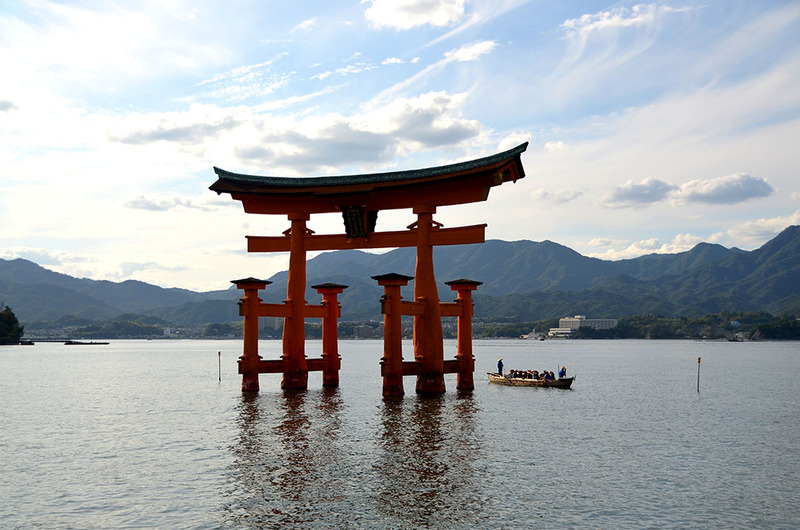 Itsukushima island or Miyajima (Shrine Island) as it is more commonly known – after the shrine that is its claim to fame – is utterly charming. It is rightly considered one of Japan’s “Three Scenic Views” and we all decide we want to stay longer than our allotted one hour. Our guide reluctantly agrees to delay our return if she is able to procure tickets for the last bullet train ‘home’ to Kyoto. She does manage the tickets, and we happily spend the rest of the afternoon exploring the enchanting shrine and soaking in the atmosphere of the equally enchanting island. We realise as we approach the shrine, that it isn’t just the camphor pillars of the majestic gate that appear to hover over the sea. The entire shrine is engineered to give the illusion of floating. Of gently skimming the reverent ripples of the incoming tide that brings with it a myriad magical reflections of the vermilion balustraded corridors. Low tide dispels the illusion somewhat, we are told, and it is common for people to walk up to the Otorii with buckets in search of clams. A compelling reason to stay overnight, that I hope to do if when I return with R.
Believed to be constructed (in the 6th century) in the Shinden style, and styled after a mythical dragon palace, the Itsukushima shrine is dedicated to the three daughters of Susano-o no Mikoto, the Shinto deity of the sea and storms. The architectural details of the present structure – a relatively newer restoration from 1168 – are marvellous and I have elaborated on a few in some of the captions below. Its design isn’t all aesthetic however. Commoners were not allowed on the island for the longest time, and were expected to pass through the Otorii to worship at the shrine. The floating structures ensured these people stepped through a transitional threshold – between land and sky – thus safeguarding the sanctity of the sacred island from ‘defilement’! 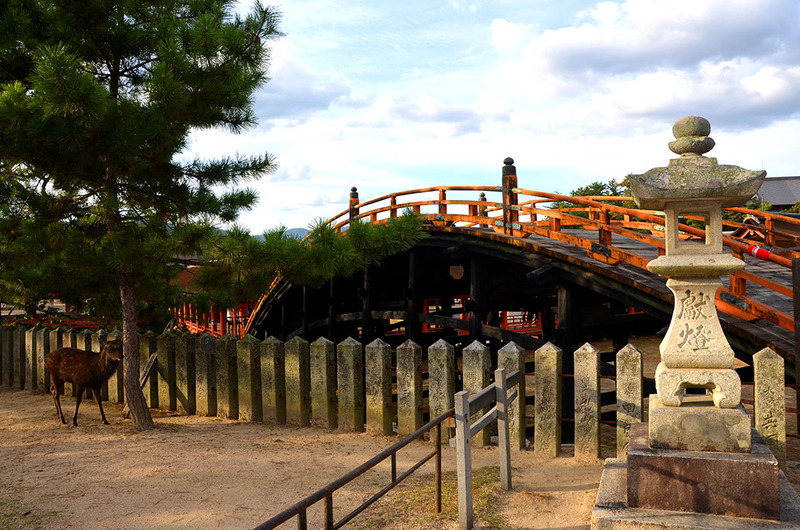 Miyajima was always considered an abode of the Gods and of the spirits of the forest, and remained uninhabited for almost a thousand years out of fear of offending its divine occupants. People tending the shrine were expected to leave the island at sunset. By the time they picked up enough courage to settle here, there were stringent codes in place for maintaining its sanctity. No birth, death or cremation was allowed on the island, nor was tilling of that hallowed ground. We are informed the edicts were relaxed a bit in the early 19th century, but hospitals and cemeteries are still conspicuously absent. My sister and I walk back through the quiet winding streets grappling with the enormity of the feudal systems that much of Asia has had to deal with, and still does at home. We stop at a family run cafe for the most fragrant filtered coffee we have tasted in all of Japan. The attached garden is delightful, our hosts charming. We wish we could stay all evening. But we have a ferry to catch and we reluctantly make our way to the pier as the setting sun frames the Otorii in a blinding halo. Until next time………happy travels, no matter where life takes you. PS: Titles and descriptions of images in the main post can be viewed by hovering your cursor over them. Thank you for this treat Madhu! Most welcome Marina 🙂 Thank YOU! I’m really rather envious Madhu! I hope you get there too someday…..you do have the advantage of time! There were tourists of course, quite a lot in fact, but the streets leading away from the temple were truly delightful. What a fabulous place, Madhu, and I enjoyed your wonderful narration. I’m not surprised that you wanted more time there, and also plan to return. Your sunset pics are truly breathtaking. It’s amazing, I love the colours, reflections and its so pristine. Odd that there were no births etc allowed – that’s what makes our earth. I was unaware of the beauty of the shrine, had only seen pictures of the Otorii, so I was amazed too Gilly. And those customs of confinement after birth and death are quite common here in India and with most ancient religions it seems. Here it is taboo for the entire family to enter a temple until 40 days after a birth and 13 days after a death! Not followed strictly anymore of course, but it does exist. Japan is such magical country – everything abut is so define … stunning photos and your header image are absolutely breathtaking. It’s a country that I would love to go back to – didn’t see so much of it .. but I fell in love with Nagasaki. Thank you so much Viveka. Japan was a surprise for me. Didn’t expect to like it as much as I did 🙂 We didn’t visit Nagasaki, unfortunately. 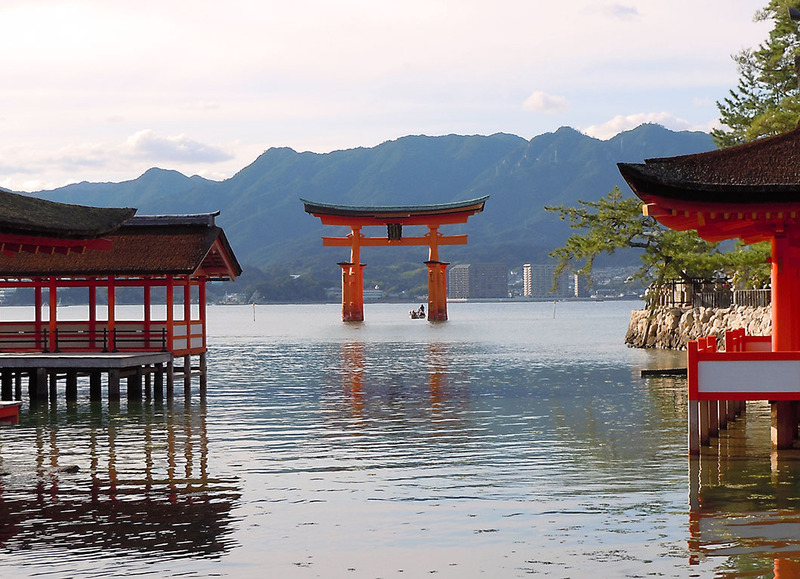 I loved Miyajima when I went there 3 weeks ago–unfortunately during a low tide! Even more unfortunately, we were only allotted a couple of hours here. So not enough time at all! Thank you for these beautiful pictures; it makes me want to go back all the more! I usually hate being ‘alloted’ time Vicki. This was an escorted tour after a long time and we were fortunate that everyone in the group was OK with staying on till that late. I would stay overnight in a Ryokan if I were you 🙂 Are you working in Japan? just exquisite madhu, how wonderful to spend the afternoon on the island and bring us such a full and wonderful report, thank you! Happy you enjoyed this Christine 🙂 It was one of our most memorable days in Japan. The Otorii! Madhu I love this post and your photos! Petting a deer? Wow, now that’s fantastic! 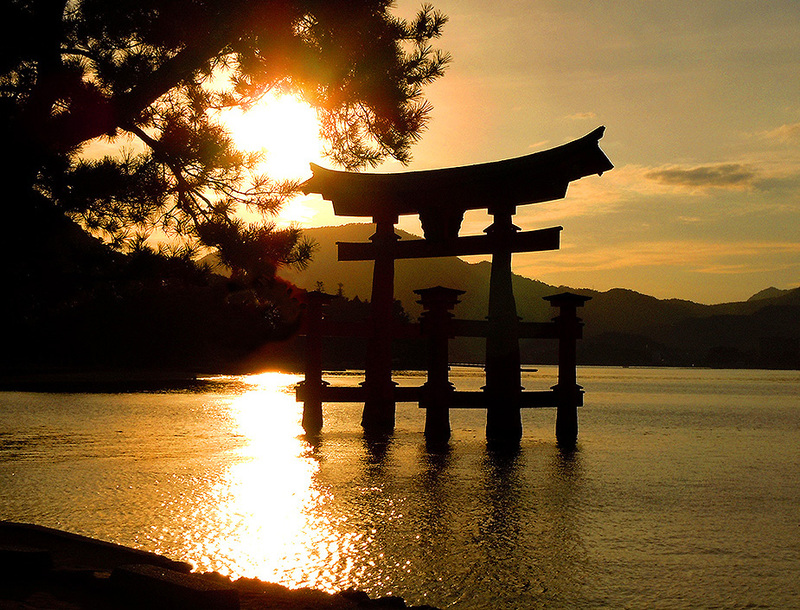 I first heard about Miyajima from a friend of mine who served in the Military and was stationed in Japan. I seriously thought he was joking about the whole “no death, giving birth, etc…” in the island, but that’s a really interesting fact! Thank you Antoinette. These are wild deer, that return to the forest at will, but I gues they have realised living among humans equals easier access to ‘food’ 🙂 Your comment just made me wonder how they cope with the demise of wildlife! Never thought to ask! I can’t possibly imagine only one hour in this place of breathtaking beauty! Fantastic shots of mystic beauty! An overnight stay is the right way to do it, and there are beautiful traditional inns on the island that i would love to ‘experience’. Thanks Patti. What a beautiful post. Your pictures and description really capture the feeling one gets after their visit. You were so fortunate to get the extra time to walk around. You knew a gem when you saw it. I know nothing of this culture so you have taken me there vicariously. Must bucket list it, too. You should, Ron would do the place more justice 🙂 Thank you Lynne. Magical, majestic, marvelous! Once again, I’ve been able to experience and interesting and exotic wonderland through your eyes. Even through your photos, it feels like a magic and mystical place. I am so glad you shared it with us. Again an interesting story with fantastic and magical photos. I always enjoy a trip with you! Too beautiful, …like it’s on another planet. You really captured the tranquil beauty of the place, Madhu! Such a majestic and beautiful place. I appreciate you sharing your wonderful photos and experience withus. it’s as if i was walking right with you through the visit. Madhu, thank you for taking me on this trip with you through your words and photographs. I didn’t have to move an inch to see this beautiful land through your eyes. You are a wonderful narrator 🙂 The sunset pictures are gorgeous! Your are too kind Amba 🙂 Thank you. Superlative! The pictures, the commentary, your own observations…. the whole post! You know, I travel with you when you put these completely bewitching posts. Awww, that is such a sweet thing to say Minakshi 🙂 Thank YOU! That’s beautiful. I’ll have to remember that if I’m in that area of Japan again. There’s so much to see, so little time. I love torii in the water – ever since I saw a photo of one, years ago. There are no words that haven’t been said by others who have commented before me. These photo’s are all magnificent and especially the last one of the beautiful sunset. I love the way you wove the events through the photo’s, too. These are all places I will never travel to so seeing them here and having you paint a picture with your words of such a wonderful day is very special to me. Thank you for being the feet behind the travels. A very beautiful and peaceful place. It really was so serene and beautiful! You would make a fabulous travel writer Madhu, with your beautiful photography and your wonderful writing style. You draw me in and I find myself wanting to go every single place you show us. Beautiful post and photos! It looks like you had a wonderful trip. I so wish to visit Japan again. Thank you so much for your lovely words of support and well wishes. I really appreciate it, Madhu. Thanks Eliz. It was one of my favourite destinations in Japan. What a beautiful place, I’d not heard about it before but would love to see it sometime. The Otorii is an image that has fascinated me since I was a teen, but I did not know what it was called or what it represented. At Disney World’s Epcot Center, one of these shrines stands in the water. Beautiful and powerful. Thanks for sharing, Madhu. Every Shinto shrine has a gate called Torii. This one is called Otorii or grand gate, because it is the main entrance to the shrine. Lovely place. 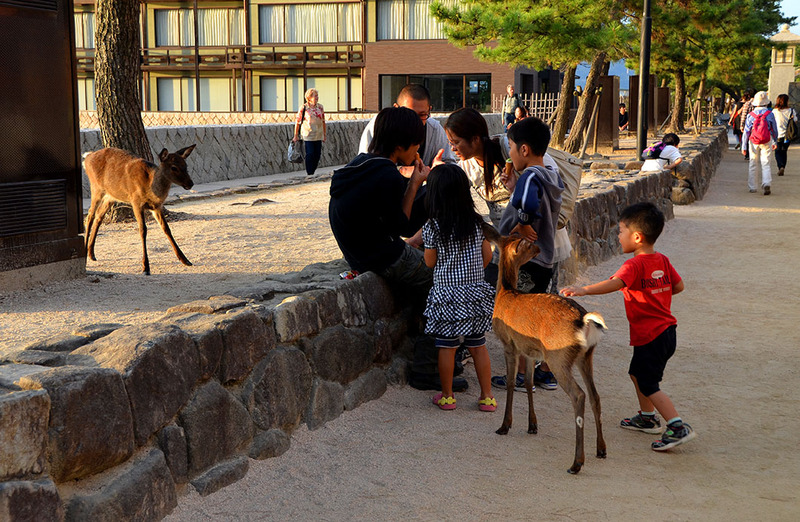 The deer are nice and tame, not like in the UK when they are afraid of man (probably because man hunts them). 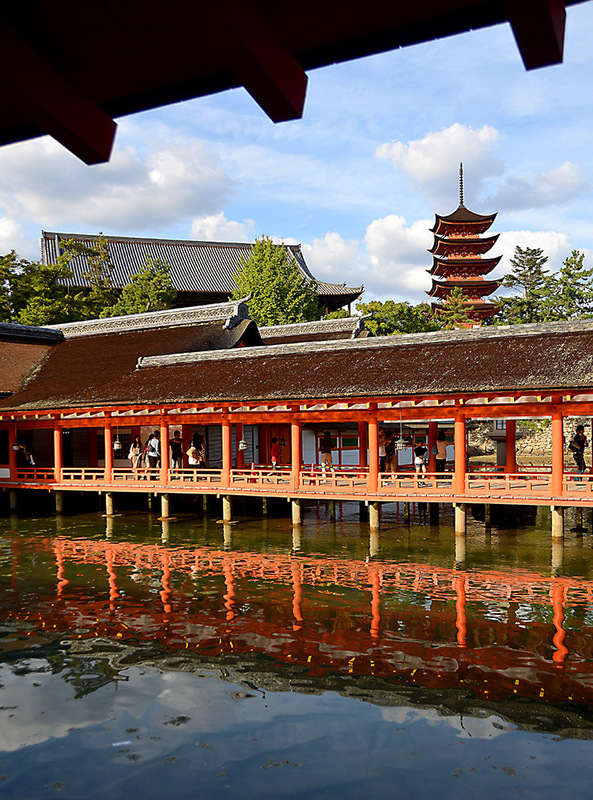 The Itsukushima shrine is a beautiful building. That was a real feast. Such an interesting part of the world.